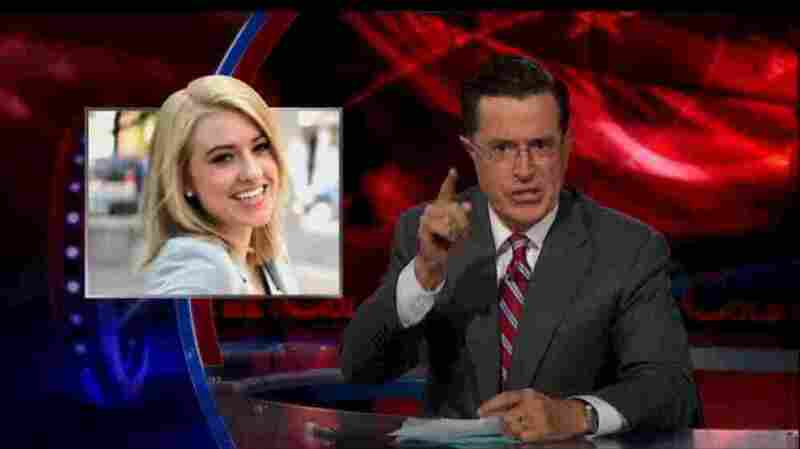 'Intrepid Cub Reporter' Katie Eastman Gets A 'Colbert Bump' It's been a pretty interesting week for the staff of TV station WOI, the local ABC affiliate in Des Moines, Iowa. In fact, for one of its newest reporters, it's been the craziest week of her life. Katie Eastman's first appearance on The Colbert Report wasn't her last. A couple weeks ago, Katie Eastman was asleep at her boyfriend's place in Chicago. She had the night off from her job as a reporter at WOI-ABC 5 in Des Moines, Iowa. She'd been on the job about two months, after graduating from college in the spring. "I woke up to a barrage of voicemails, text messages, tweets" she says. One message, from a friend across the country, said only, "Katie. I just saw everything. I hope you're all right. Call me." As she was sleeping, Eastman had just broken into the national spotlight. Her station had recently refused to air an ad from the Colbert SuperPAC, a super political action committee created by comedian Stephen Colbert. The ad encouraged Iowans to vote for "Rick Parry" in the straw poll — a misspelling of Texas Gov. Rick Perry's name. When WOI refused to air the ad, Colbert struck back on his satirical news show, The Colbert Report. Eastman and her boyfriend pulled it up online to watch. "Clearly someone needs to get to the bottom of this corruption!" Colbert railed. "Someone on the inside, like intrepid WOI reporter Katie Eastman." At that point, Eastman says, "I just died." Colbert flashed Eastman's headshot and cut to a clip of her reporting on "the longest annual garage sale in Iowa." "Katie blew the lid off of Garage-Sale-Gate!" Colbert said. "Clearly, Katie, you're the only one I can trust. Call me." "I started screaming, and just like pacing the kitchen floor," Eastman says. "Like, 'That just did not just happen! No! That was my face! Oh, my gosh!'" For most local news reporters who've been mocked on late-night television, that would have been it. Just the one-night punchline and everyone moves on. Not so for Katie. The next week, Colbert circled back, picking out her coverage of a new city dog park. "I smell a poo-litzer!" Colbert said. Eastman's pretty excited about her sudden celebrity. "It's national television. The Colbert Report!" she says — though not without some trepidation for her career. "I just — I really hope people don't think I only cover puppies." Whatever they might think of her, there are definitely more people out there doing it. Someone set up a Facebook fan page for her. The local Fuddrucker's named a burger after her. "Someone from California tweeted at me and said they had a dream about me," she says. "Isn't that weird?" And it looks as though Eastman's "Colbert Bump" isn't over yet. Her name was back just last Thursday, when Colbert brought the WOI news team onto the show. "Where's intrepid cub reporter Katie Eastman?" he demanded. "She's off today," they told him. Which she was, she says. She probably needed the break. "You can laugh at yourself," she says. "That's what I've been doing."